We were created to educate our clients about the process and cost of private jet travel so they can make better, more informed buying decisions. At Stratos Jets, we strive to deliver the highest standards of service and value for every private jet rental that we coordinate. To achieve this, we do things a little bit differently than our competitors. It starts with our operational framework, which is specifically designed to meet our clients’ needs. While many of our competitors are focused on making the sale and moving on to the next customer, we want to ensure you receive continued support as we plan your private jet services together. This approach is different from our competitors, as most rely on a single agent to oversee the entire process. We feel this invites the potential for costly errors and substandard service. At Stratos Jets, if you have any questions, or require a last-minute amendment to your itinerary, you can count on our Trip Support team to handle it. A broker that doesn’t have a dedicated support department to make these adjustments is less likely to deliver the value you’re paying for. Not only do we hire the best talent available, we also support our team members by continually investing in technology. This allows us to deliver industry-leading customer service. These processes result in the proper organization of your charter flight, every time. If your current broker hasn’t made these investments, how do you know they’re truly invested in you? Every time you rent a private jet, there is an element of risk involved. We mitigate that risk by promoting a culture of air charter safety throughout our entire organization, right down to our operational processes. Through our Approved Vendor Program, we identify and continually monitor charter operators who meet our standards for safety. This due-diligence process ensures that every operator in our network has the appropriate experience and track record to perform the flight safely, and is certified to fly under FAA Part 135 regulations. You don’t have to take our word for it. As an ARGUS Certified Broker, we have the endorsement of a world leader in aviation safety to vouch for our operational integrity. Many jet charter brokers aren’t able to meet the rigid standards ARGUS sets for delivering superior safety, service and convenience, but Stratos does. In part, that’s because we’ve invested in the infrastructure, equipment and aircraft vendor relationships to offer an outstanding experience at every step. As part of the ARGUS onsite assessment, we’re evaluated on and upheld to 10 Standards of Excellence, which includes everything from ethical business practices and regulation compliance to fiscal integrity and passenger safety. Learn more about the value of ARGUS Certified Brokers, and why you should be insisting your broker meets these standards. 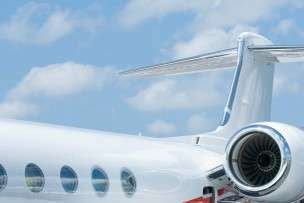 Our role is to coordinate your jet charter services, but it’s up to the contract vendors to execute them, and sometimes plans change, or don’t go as anticipated. We’ve developed solid working relationships with a network of industry partners who we trust, and with whom we do a lot of repeat business. In the event that a service provider fails to fulfill its responsibilities as expected, we will lobby on your behalf to ensure that a fair resolution is reached. In addition to the high minimum liability insurance Stratos requires of any air carrier to serve our clients, Stratos also invests in and maintains its own $25 Million Non-owned liability policy to give you valuable added protection and peace of mind. This policy is an investment in our clients and This policy does not get watered down by those who would otherwise make a claim against the aircraft’s own policy, such as pilots, maintenance, the air carrier, the aircraft owner and anyone who may be impacted on the ground. –Joel Thomas, President & CEO, Stratos Jet Charters Inc.